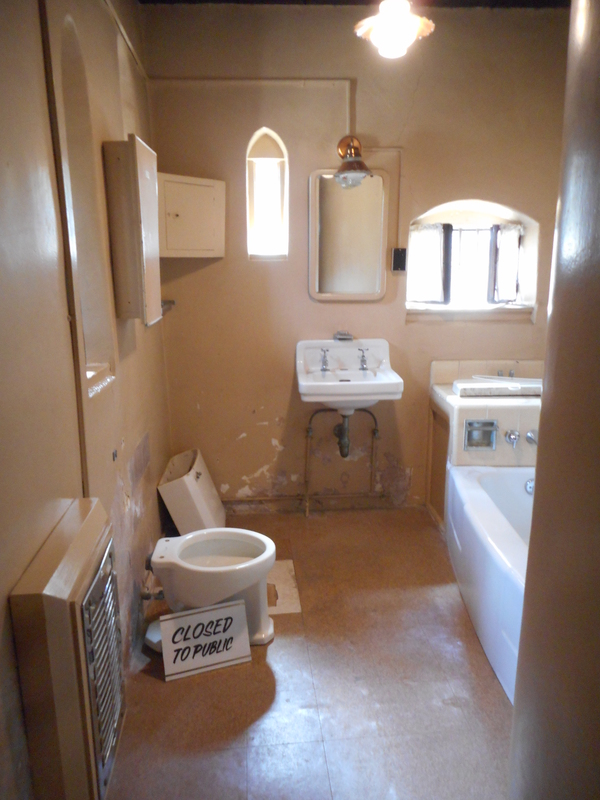 The Lummis House wasn’t what I expected. I first saw the house as I sat perched, in my car, next to a stop sign at the Avenue 43 off ramp. I could vaguely see the house off in the distance through a chain link fence. My first impression of the house wasn’t positive but once I rounded the corner — and saw the open gates below — my impression changed. You come upon the house slowly. It’s down a sandy path and obscured by trees. Then, there it is. Isolated like an oasis from the nearby Pasadena freeway and the densely inhabited neighborhood that surrounds it. I walked down to the end of the house and took a picture of the house from the west side with the turret prominently centered in the picture. 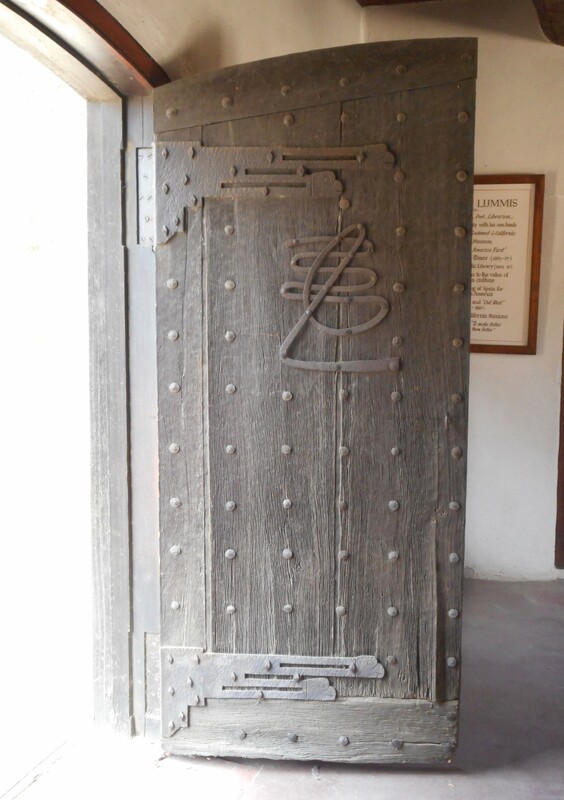 The front doors have been exposed to the elements for so long that they have taken on a grey tint. 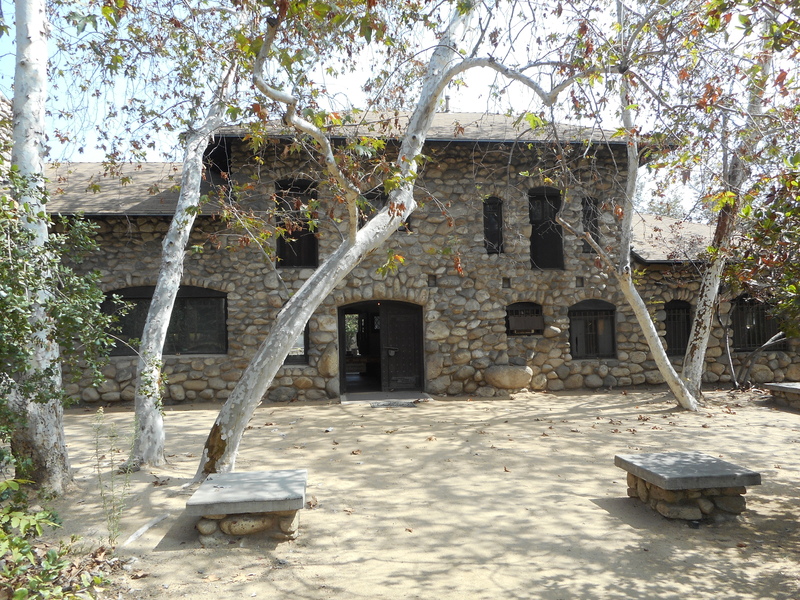 There are number of brochures available at the Lummis House. 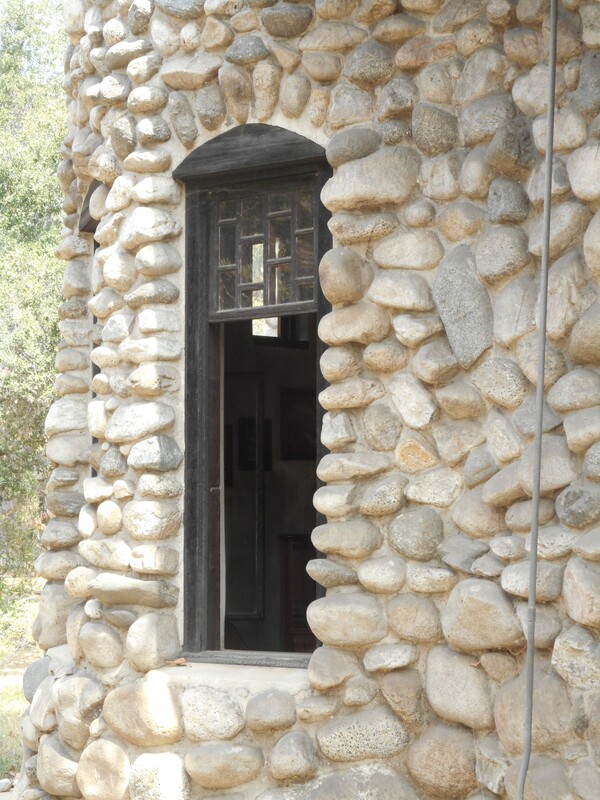 According to the brochures the house was begun in 1897 and Lummis used stones from the nearby arroyo to build the house. Supposedly, he built the entire place himself but that seems unbelievable. 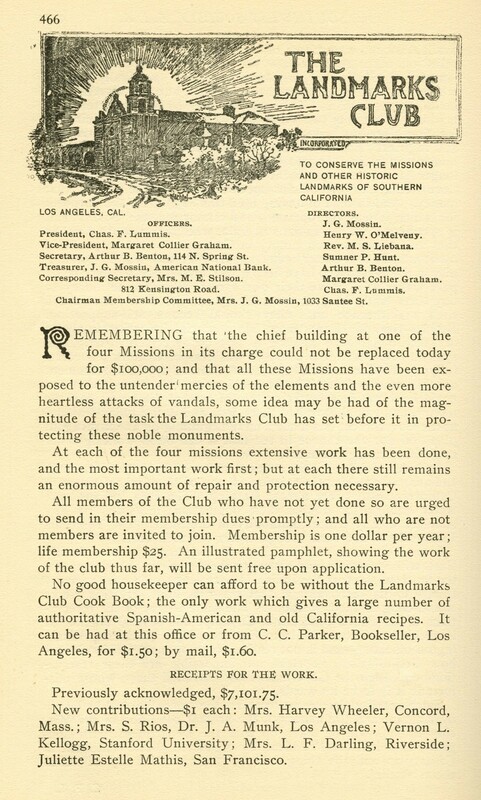 Even one of the brochures contradicts that and states Lummis was helped by Native Americans. The home is also known as El Alisal which means “place of the sycamores.” Lummis, who had a big ego, claimed his house was “built to last a thousand years.” The reality is the house was lucky to have survived into the latter half of the 20th century because the home was neglected after his death due to the public’s lack of interest in him and the house. 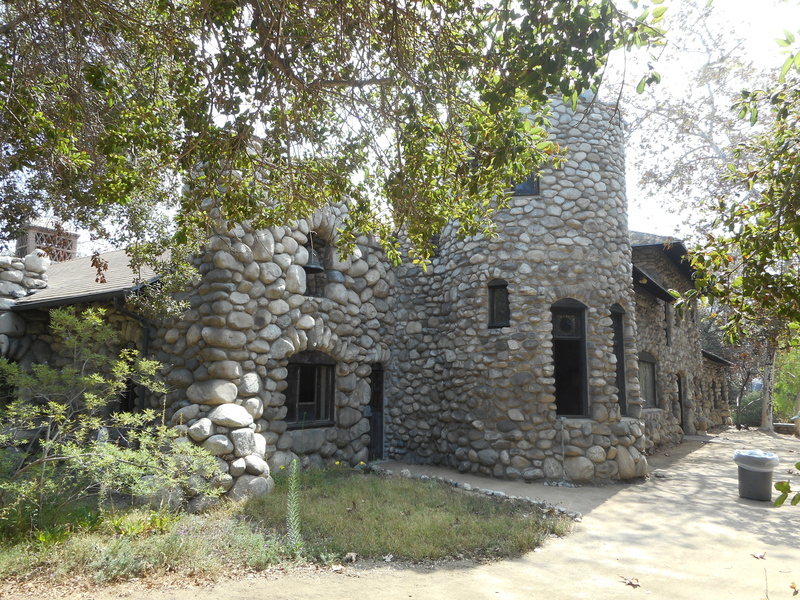 In Edwin R. Bingham’s book, Charles F. Lummis: Editor of the Southwest, Bingham states Lummis bought the land for his home in 1895 but he didn’t start work for three years then spent a decade and a half building the house. The front entrance is six feet wide and seven feet high and each door weighs almost a thousand pounds which sounds possible but a bit of an exaggeration. The museo’s floor is concrete as are most of the floors throughout the house. 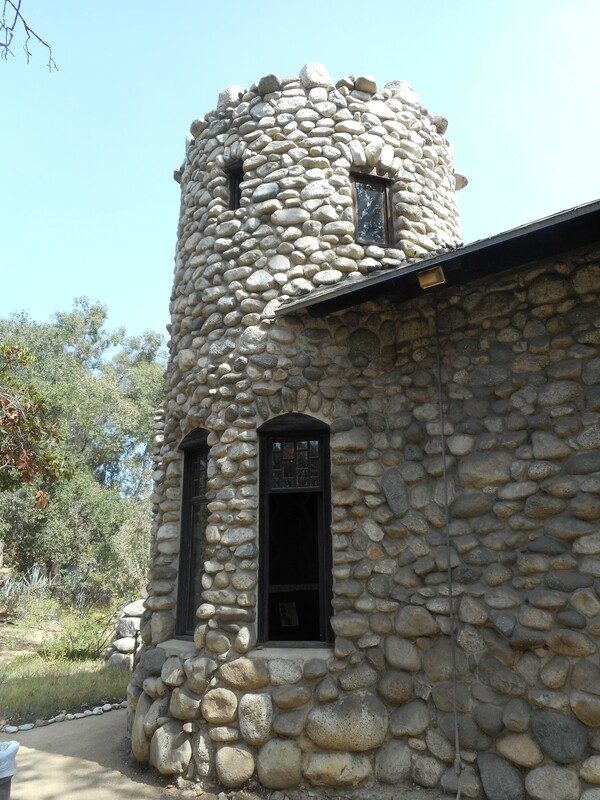 Bingham also states that Lummis saw the construction of his home as a way to keep his physique in shape. *Maybe, Lummis is claiming to be the architect of just the addition? Lummis had a big personality and appeared to have an unending amount of energy. 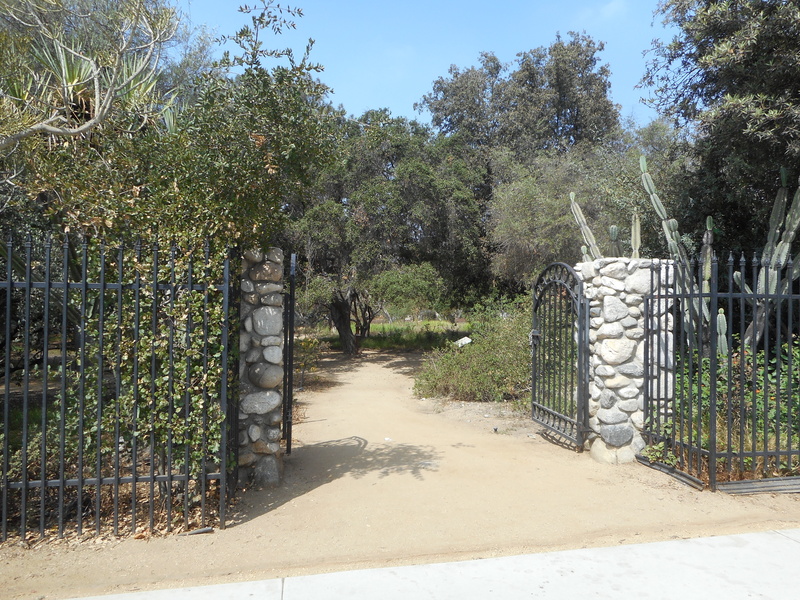 According to Charles Fisher’s book Highland Park, Lummis attended Harvard from 1877-1881 but failed to graduate. He was short, five foot tall, but liked to engage in athletics. 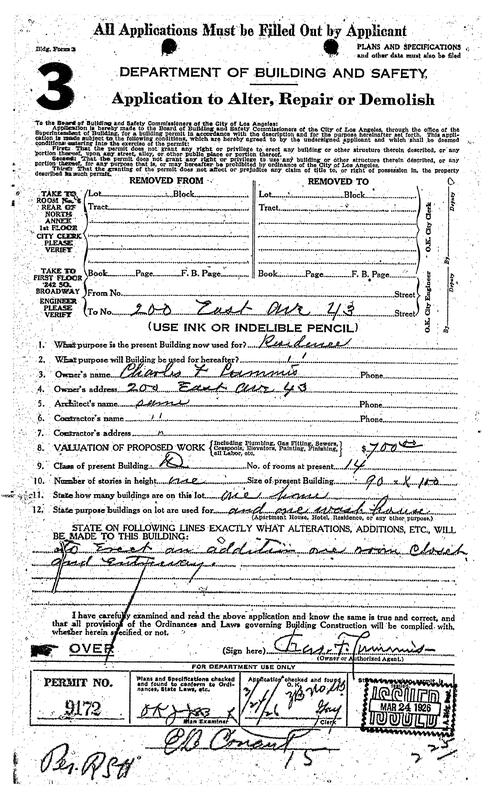 [One of the Lummis brochures contradicts Fisher’s height claim. 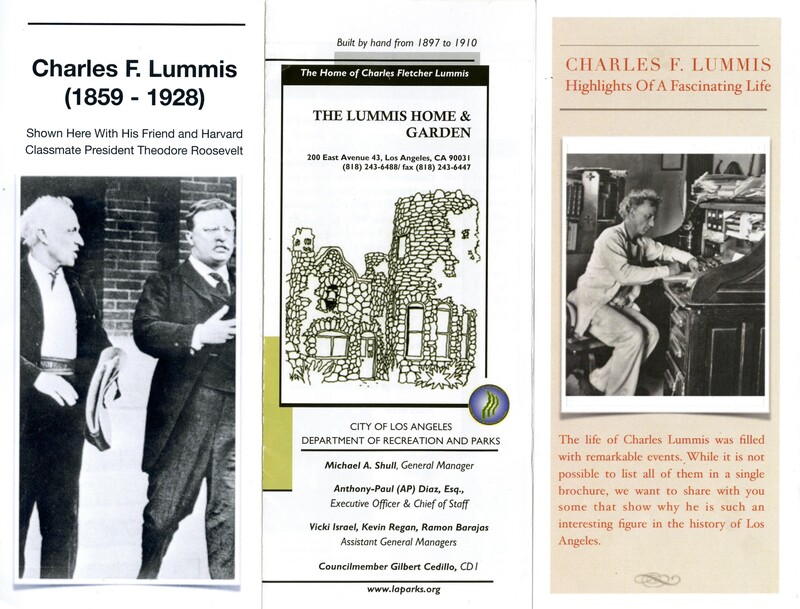 The Lummis Home and Garden brochure states Lummis was five foot, seven inches.] He suffered a stroke at the age of 27 and it was thought the stroke was a result of working long hours at the Los Angeles Times. Fisher states that Lummis was viewed as immodest, by some, because while working on his home Lummis was often seen wearing thin shirts and shorts. Lummis in a green corduroy ensemble. Evidently, Lummis liked to wear the same outfit whenever he ventured out as a man about town. He had a favorite green corduroy suit, according to Fisher’s book, which is a totally inappropriate garment for the Southern California heat. 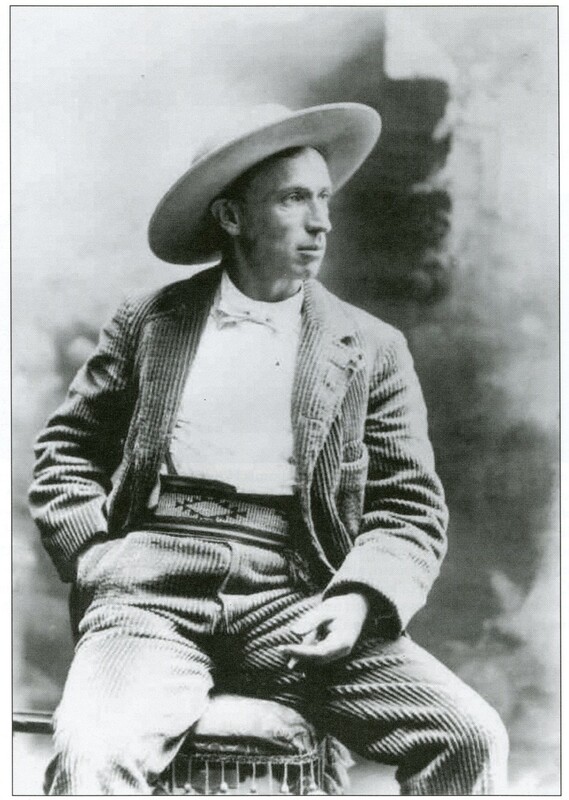 Lummis would complete his Harvard-to-cowboy-get-up by wearing a sombrero and a red sash in the Spanish style. I have no idea what the Spanish style is but I suspect it can be defined as “Look at me.” Courtesy of the Braun Research Library Collection, Autry Museum, Los Angeles: p. 32537. Below is the Lummis entry From Who’s Who in California 1928-1929. What’s up with his hair!? It’s very Sideshow Bob-ish. Notice that Lummis is a honorary member of the Davenport, Iowa Academy of Sciences. I grew up in Davenport, Iowa. I don’t think they have an Academy of Sciences anymore. The second column of his Who’s Who entry. 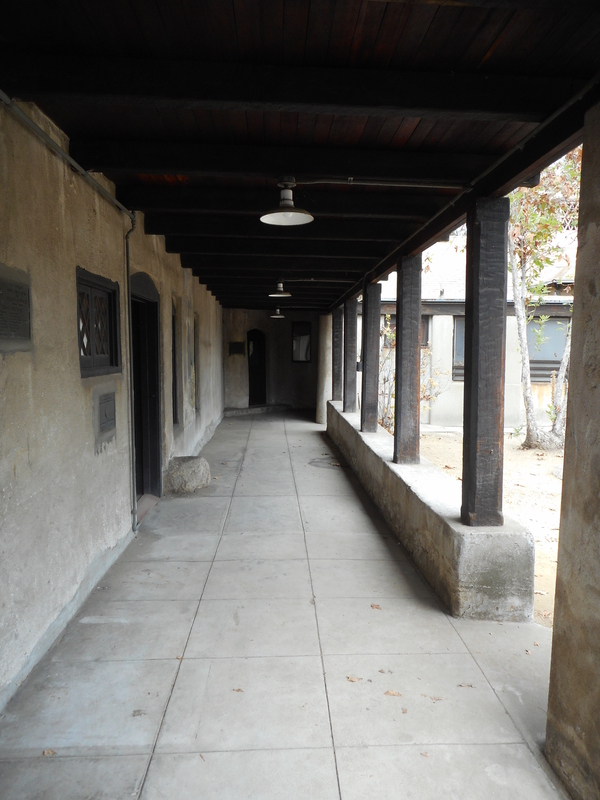 Lummis was interested in saving the old California missions and he formed the Landmark’s Club for that purpose. Architects Arthur Benton and Sumner Hunt were two of the organization’s directors. I scanned this page from the January 1904 issue of OUT WEST. This room measures 28 feet by 16 feet. 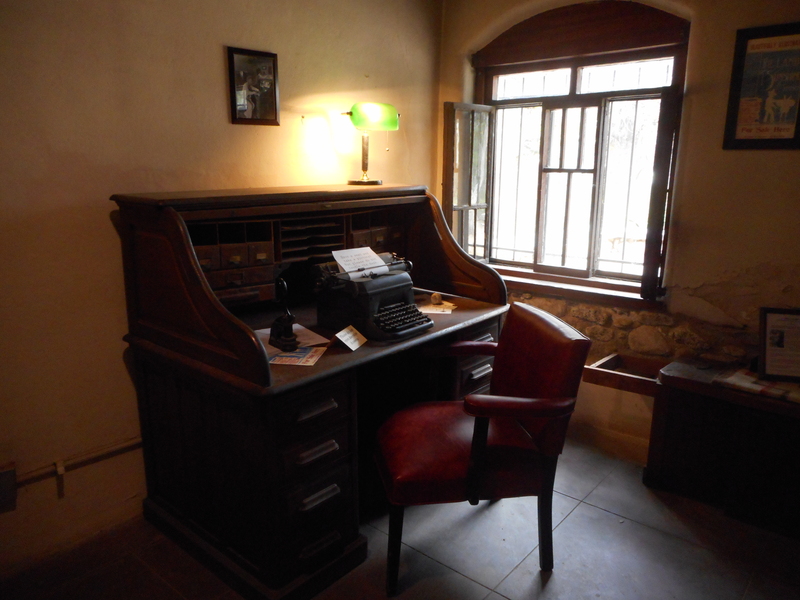 It is the Museo room. 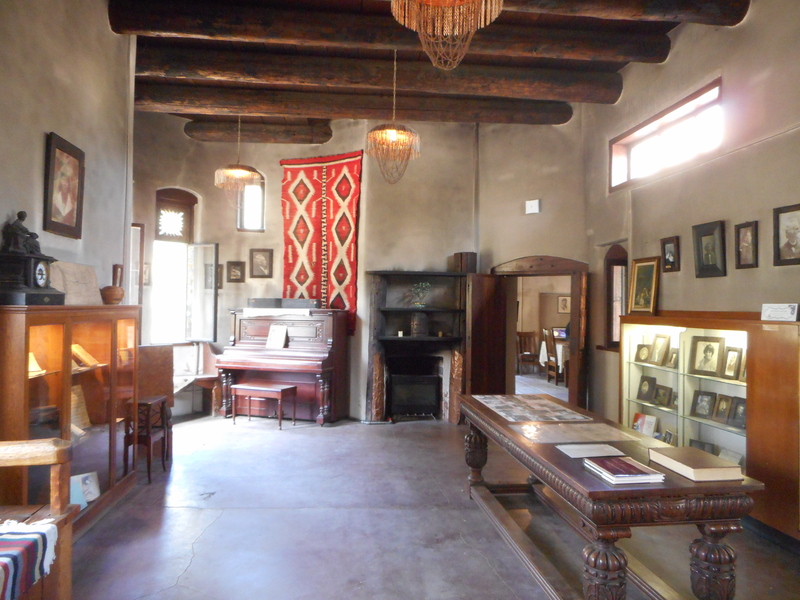 In the previous photograph of the Museo room there is a bench, covered with a serape, on the left side of the photo. 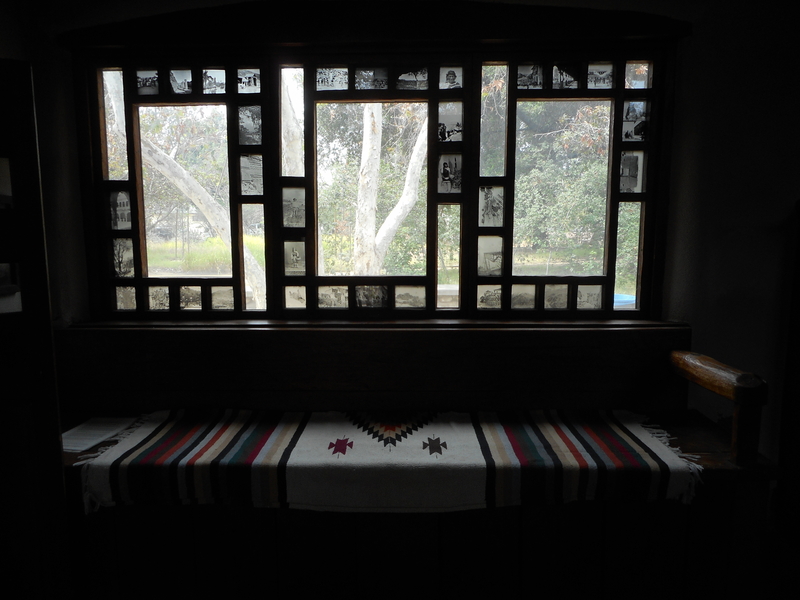 You can just see the arm rest, part of the serape and part of the leg of the bench. 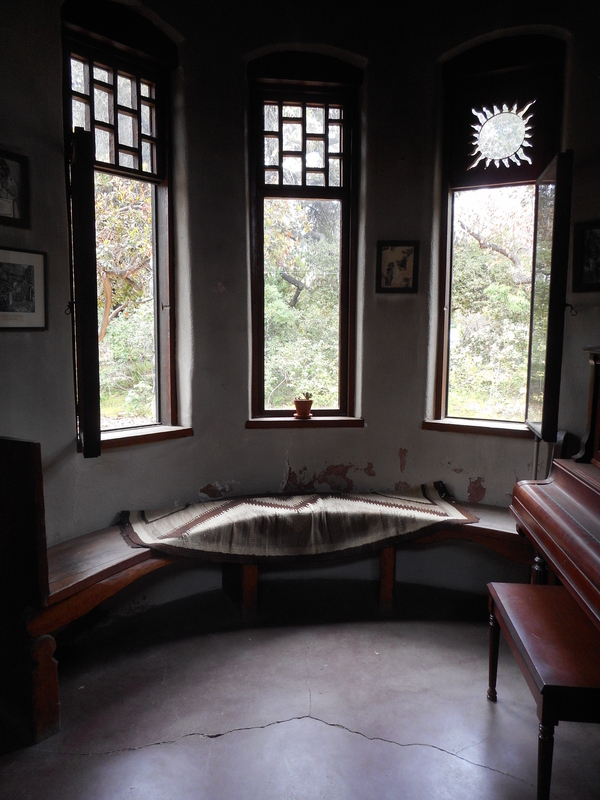 This is the window above the bench which contains photographs that were produced as slides and inserted into it. This was done when the home was built. One of the images in the window. Looking out of the turret windows. Lummis worked in the publishing and writing fields throughout his life. 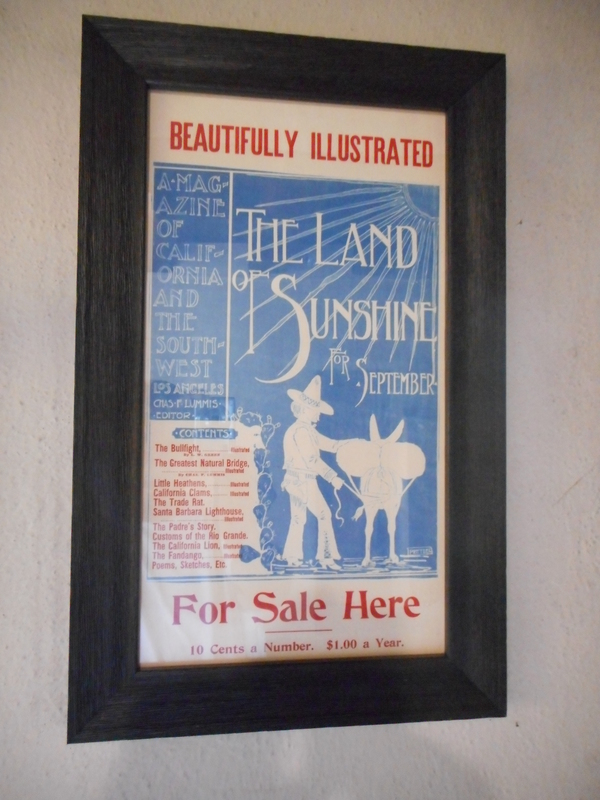 He wrote books, worked as the city editor of The Los Angeles Times and was the editor and publisher of Out West and this publication The Land of Sunshine. 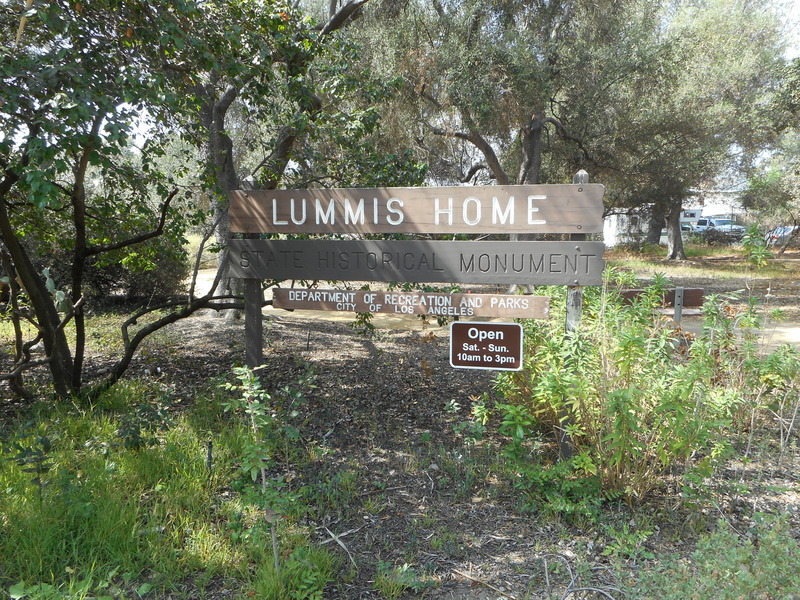 Lummis was married three times and divorced three times. 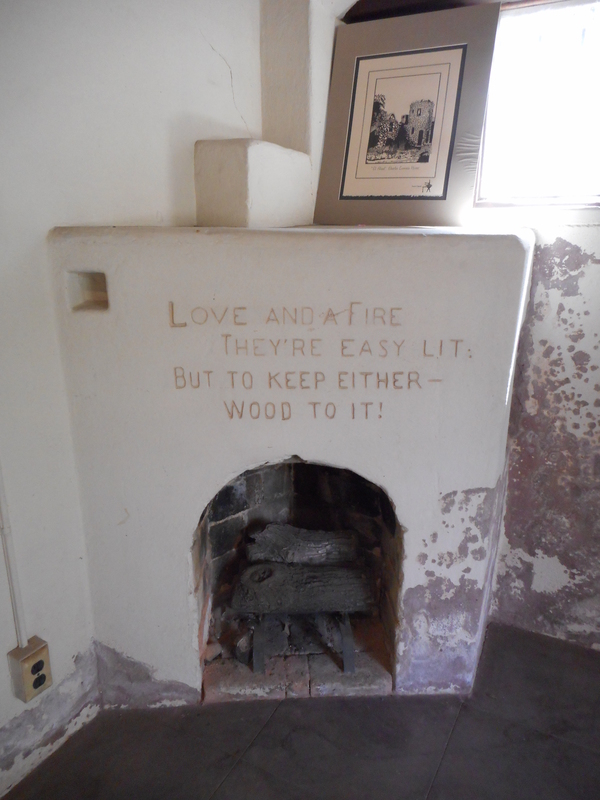 The text on the fireplace means what you think it means. 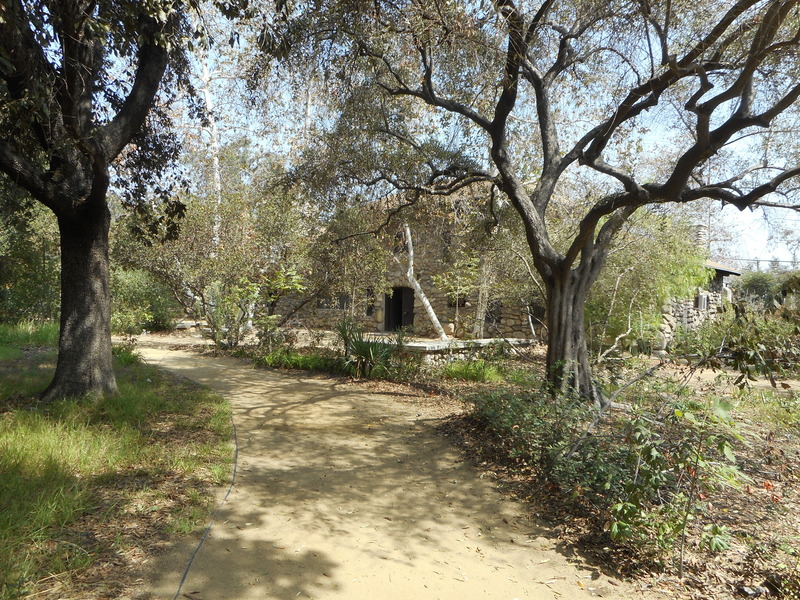 His second wife, Eva Douglas, came to see Lummis as a “roving Lothario” according to Mark Thompson’s book American Character: The Curious Life of Charles Fletcher Lummis. She read his diaries and was able to decipher his secret code regarding his mistresses (which he mentioned in the diaries). She fled to San Francisco with her children and was taken in by Phoebe Appleton Hearst. A noisy, scandalous divorce proceeding was on the horizon until Lummis sent a letter to his wife and Hearst detailing how he planned to sue Phoebe Hearst for $100,000 due to his loss of “consortium.” He also planned on seeking damages from Hearst for kidnapping his children and turning them against him. After his written threats were delivered a quiet settlement was quickly reached. The 1950s bathroom next to the master bedroom. 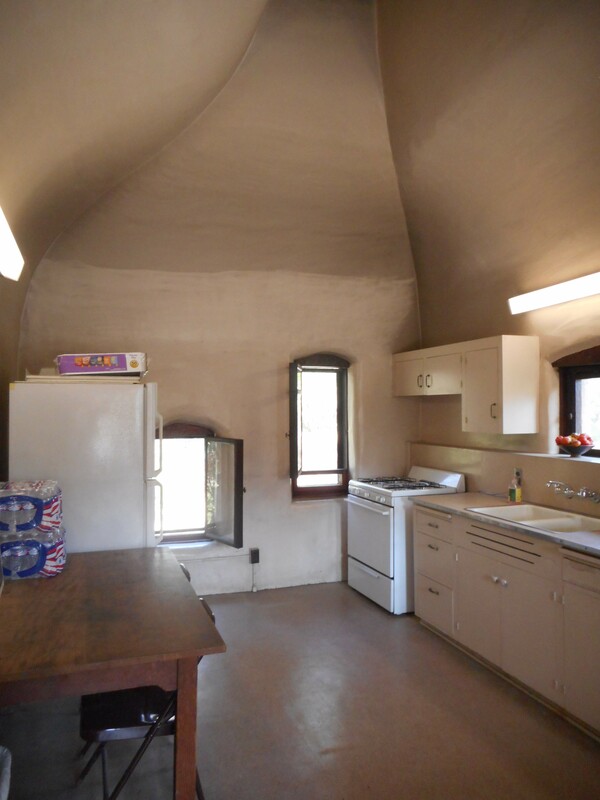 The large kitchen looks like it was last updated in the 1950s. The peristyle on the patio side of his home. His initials are on the door. I see the C for Charles and the L for Lummis but I’m not seeing an F for Fletcher. The iron work was done by Maynard Dixon. I admire Lummis for what he accomplished in his life. He was the force behind the construction of the Southwest Museum and worked for the better treatment of Native Americans. 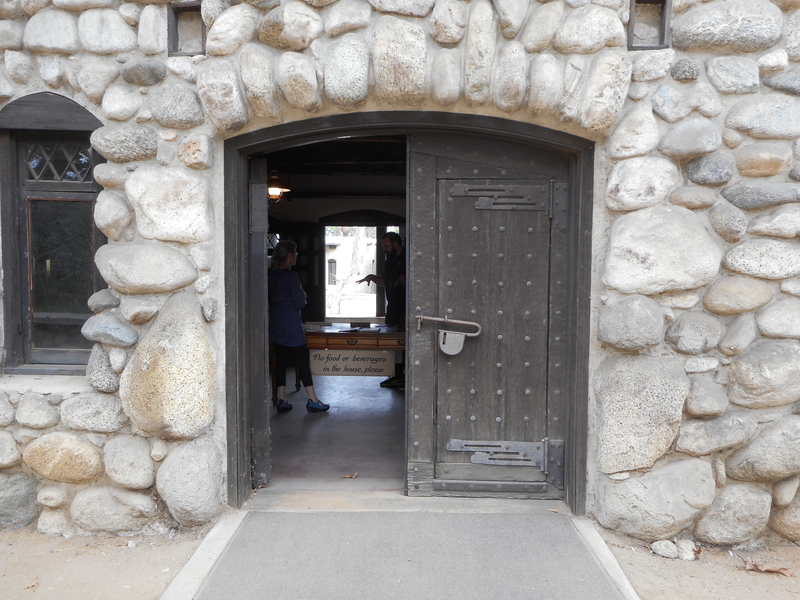 He built an amazing house and sought to preserve California’s missions when few people cared about them. 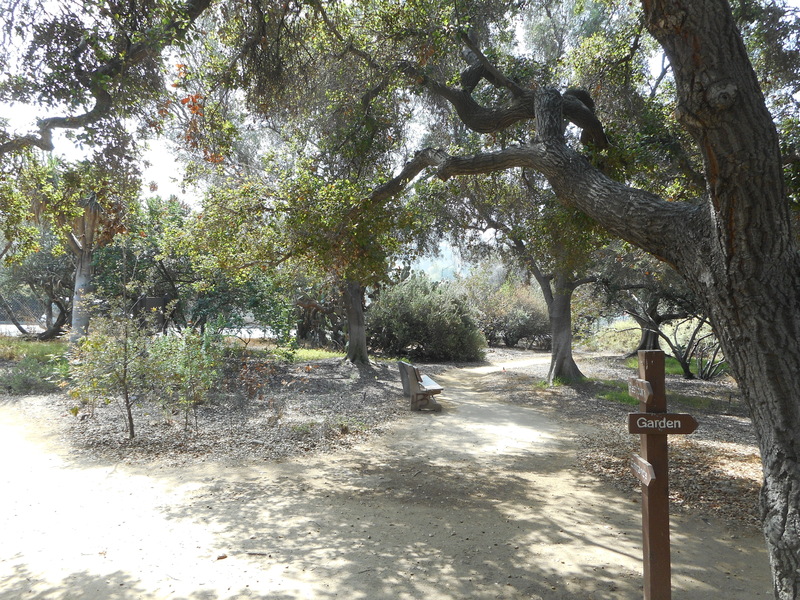 Lummis made a positive difference in Southern California and “The Land of Sunshine,” as he referred to it, is a better place because of him. Lummis died on November 25, 1928 from brain cancer. He was sixty-nine years old. 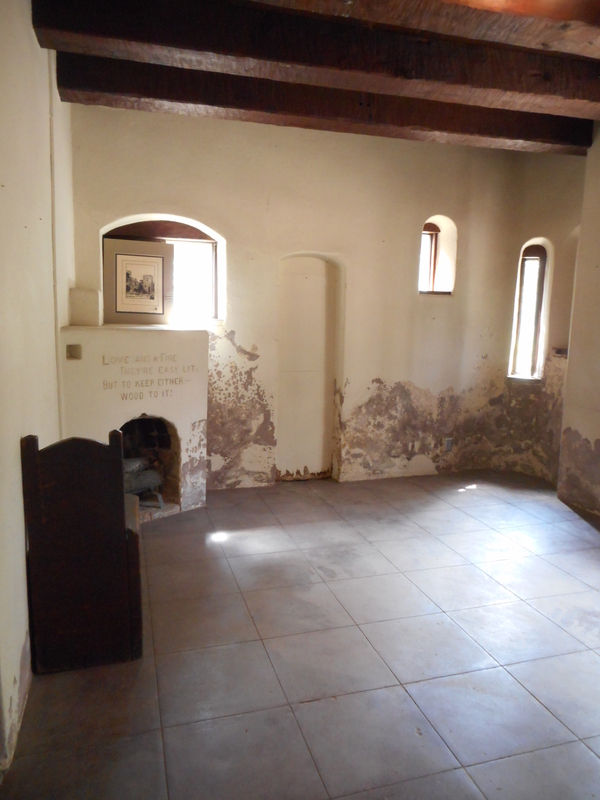 His ashes are buried within one of the walls of his home. There is a KCET ARTBOUND documentary about Charles Lummis called Charles Lummis: Reimagining the American West. It can be found on YouTube and it’s 55 minutes. Bingham, E.R. (1955). Charles F. Lummis: editor of the Southwest. San Marino: Huntington Library. Fisher, C. J. (2008). Highland Park. Charleston, South Carolina: Arcadia Publishing. Gordon, D. (1972). Crusader in corduroy. Los Angeles: Cultural Assets Press. The Landmark’s Club. (1904, January). Out West, 20(1), 466. Thompson, M. (2001). 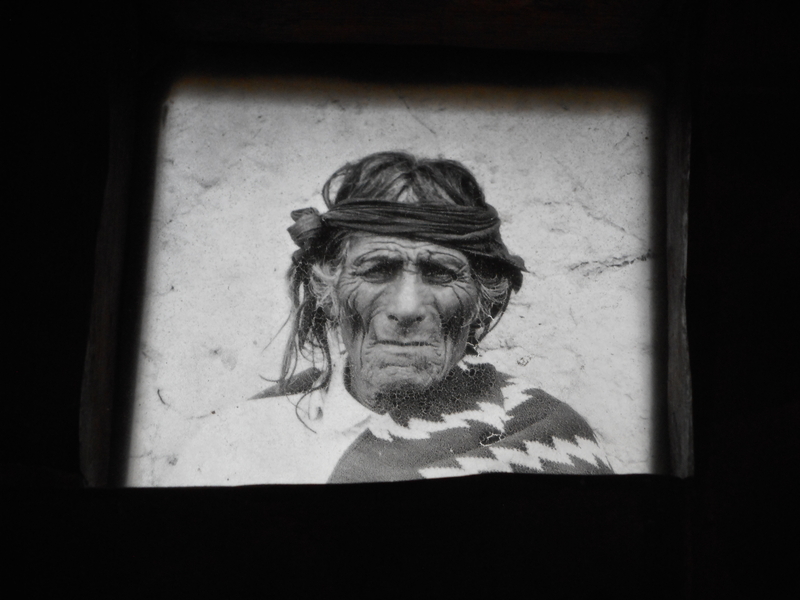 American character: the curious life of Charles Fletcher Lummis. New York: Arcade Publishing. The photo of Lummis in his corduroy suit is Courtesy of the Braun Research Library Collection, Autry Museum, Los Angeles: p.32537. [i] Bingham, E.R. (1955). 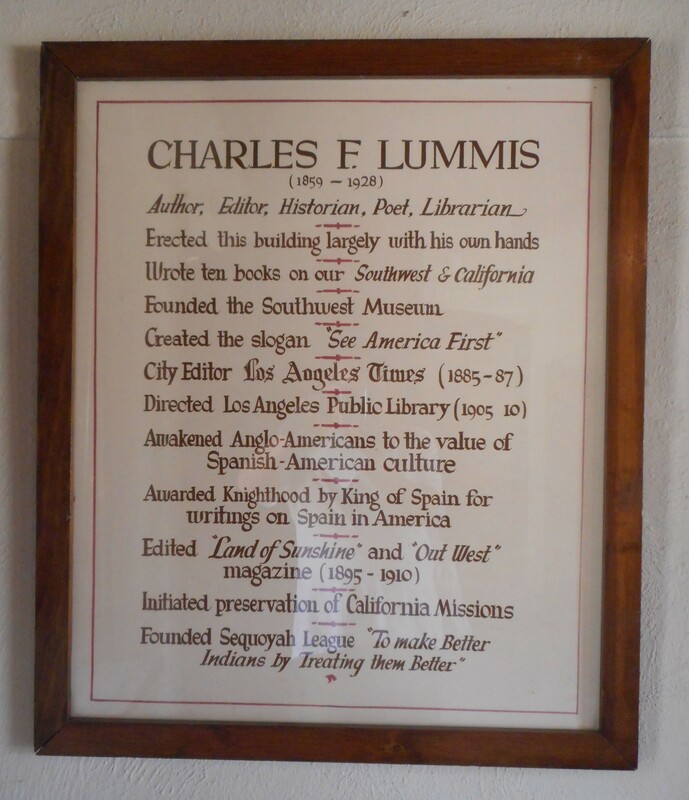 Charles F. Lummis: Editor of the Southwest. San Marino: Huntington Library.